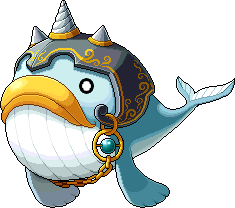 A very rare giant whale that only lives inside the Temple of Time. With its thick fins, it swims through air instead of the water, eating pieces of memory that float around. It is said that it only eats happy memories so it is always in a good mood. It often gives the Temple Keepr a headache because it even eats the memories of those visiting the Temple of Time, but because it is an endangered species, there's nothing he can do about it.